After a weekend away with no vacuuming last weekend and house guests arriving next weekend, this weekend was circled in red on the calendar with the words “CLEAN HOUSE” scribbled all over. We made a dent in the to do list and still had an enjoyable family weekend. The biggest task we undertook and completed was finishing painting LC’s room. While we kept the room the same color as it was when we purchased the house, we had removed some fixtures from the wall which left large unpainted areas. Shortly after removing the fixtures, a baby unexpectedly arrived and painting took a back seat. Only one more picture to hang and then I’ll finally post a tour of the nursery. Another chore that I had been unable to find time to accomplish was finally taking all of my maternity clothes out of the drawers and putting them away, as well as general organization of my closets. A helped me tackle this today and I think this will help reduce my stress in the mornings, since my clothes are organized and easier to find. The never ending laundry and vacuuming continued today – thanks in large part to A getting up early and doing two loads of laundry while I slept in with LC. Our house is probably not house guest ready yet, but I don’t think it looks like we’ve left B-Cat in charge of housekeeping anymore. And some days you just have to take these small victories as they come. Filed Under: merry married life, visitors to the guest room, who let us buy a house? This is our fifth Christmas together, our third since we’ve been married and the first one when we will spend it together as a family, just us. No traveling, no extended family obligations and for the last and only time, just the two of us. (and Cal and B-Cat, but they go without saying). We’ll miss our families and not being able to spend Christmas with them is one of the side effects of living across the country. But I think we are also both looking forward to having a quiet holiday of just the two (four) of us and the opportunity to start some holiday traditions for our family. One tradition I hope we’ve started today is the fire. 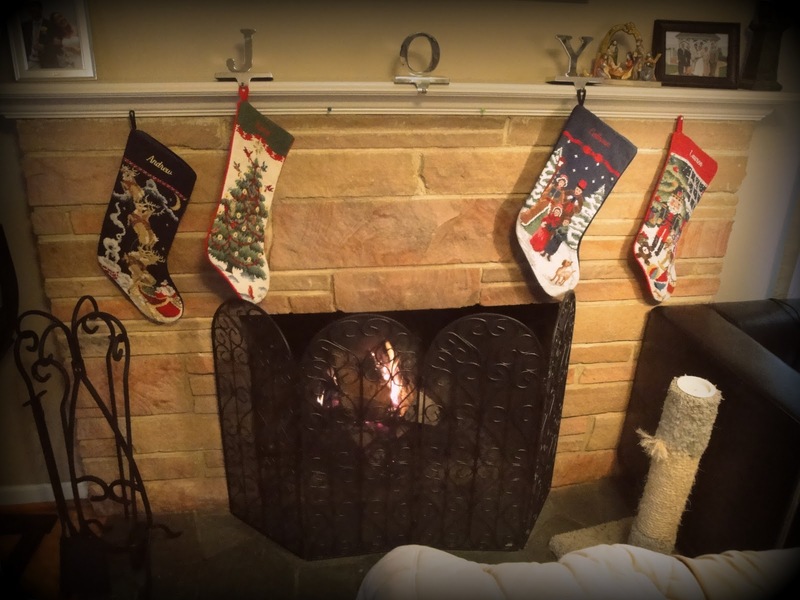 As you may recall from the home tour, we have a beautiful fire place, complete with stockings hung with care, but it was previously filled with pebbles and votive lights – a leftover from the previous owners. It was really important to me to be able to have a fire in the fireplace this weekend, so this morning A, Cal and I piled into the car and headed to Home Depot (and Lowe’s) and picked up our fire supplies. A worked hard and now we have a beautiful fire, providing warmth to the house and a delightful crackle in the background. The pets were unsure of the noise at the start, but they’ve both been asleep for hours now, enjoying a relaxing, lazy Christmas Eve afternoon by the fire. Another tradition we’ve done since being married is displaying all of our Christmas cards. Christmas cards are probably one of my favorite things about the holidays. I love designing our photo card and getting them together every year. I even enjoy writing and addressing them. But I love nothing more than receiving them from friends and family. Photocards now allow us to see photos of friends’ children who we may not see that often, or to see what adventures our friends have been up to in the past year. Most of all, who doesn’t love receiving mail!? 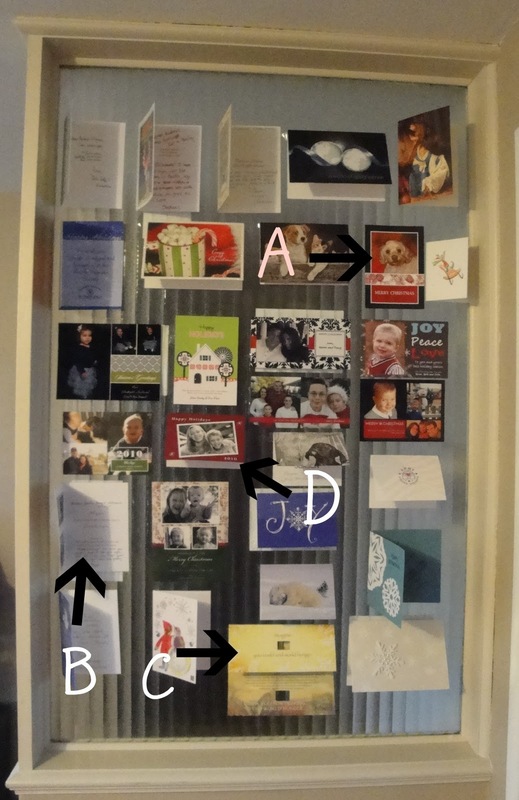 Here is a look at one side of our Christmas card wall, I’ve highlighted a few for you – see below for the key. A – This card involves a dog named Frank wearing antlers. It may be my favorite card of the season. B – This card announced our dear friends were expecting their first baby! We are so excited the CCBOJ will have a little friend close to her age to learn to ski with! C – This card is from Heifer International, making a donation in our name. 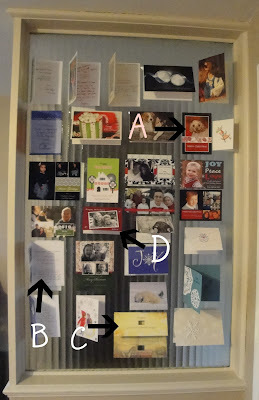 A great idea for holiday cards. D – This card is from the family from whom I baby sat all through college. The “baby” is 9 years old now. I’m pretty sure that makes me really old. We’re still trying to determine what other traditions we will put in place, something I am sure will develop more once the CCBOJ is part of the celebration. But one thing we are both looking forward to tomorrow is waking up in our own beds, ready to greet the Christmas morning. Filed Under: holidays, merry married life, who let us buy a house? Home for the holidays, with a tree! I have very strong opinions about Christmas trees, which is not surprising since I have strong opinions about a lot of things. But I think Christmas trees should be live. It is Baby Jesus’ birthday and Baby Jesus wouldn’t want His Christmas tree to be bought at Target with lights already on it. Or at least I don’t think He would. So without further ado, here is our Christmas tree this year. We decorated the tree while watching the Pats awesome victory on Sunday. Please recall I am pregnant. So I only wear sweatpants on the weekend. Don’t judge. I am wearing a maternity Pats shirt, so points for that. A is stringing the lights while wearing his Duke santa hat. Another strongly held opinion of mine is that Christmas tree ornaments should reflect the tree’s owner. I’m not a fan of trees that are all white or blue or just has snowflake ornaments. I’m sure some people have strongly held opinions that say that your tree should look like the pages of a Pottery Barn catalog, but I’m just not one of those people. The thought of being able to add an ornament next year that reflects the CCBOJ’s first year with us warms my heart. Here’s a quick tour of some of the ornaments on our tree that I think reflect us, both as a family and individually. These first two are not really surprising – our winter weekends are planned around football and we love our teams. We’ve gotten each other ornaments for our teams. There are two Patriots’ Nutcrackers on the tree; I call them Wes and Ben. These ornaments represent places we’ve lived. The top is from Old Town Alexandria, our home sweet home until June. It is a beautiful hand painted glass ball I purchased at Art on the Avenue in Del Ray a few years ago and it makes me very happy to hang it on the tree. The trolley ornament is from our first Christmas together (aww) when A was going to school in the Bay Area and we spent a weekend in the city over the holidays – our weekend included a ride on the famous San Francisco Cable Cars. B-Cat has many ornaments on the tree, she’s been around longer and therefore had more time to accumulate ornaments. For some reason I didn’t grab a picture of one of them though, but here is Cal’s beagle. He is on the side of the tree the faces the windows and the ornament is keeping an eye on the front of the house, like a good watch dog should. (He is a little quieter about it than Cal). Filed Under: emerald city, holidays, merry married life, who let us buy a house? It has been a very, very rainy weekend in Seattle. Not a little rainy, gray and misty like one is to expect in Seattle, but a “Pineapple Express” tropical storm rainy weekend that has caused flooding and mudslides throughout Western Washington. With the exception of encountering some large puddles and potholes, our home and weekend have been relatively unaffected. We used the weekend to pull out the holiday decorations and get the house appropriately in the spirit. Here is our mantel, complete with the stockings. The “JOY” used to be our stocking holders when it was just A, B-Cat and me. Now there are four of us with one more to arrive soon, so buying four stocking holders seemed like a waste. And while next year we could use “PEACE”, I figure the possibility of having more children or pets is pretty high and so any future stocking holders will be generic in nature. To the right of the silver “JOY” is our other “Joy” on the mantel, this one a small nativity scene, which appears at the top of this post. It is my goal to be able to have a fire in the fireplace on Christmas and Christmas Eve. I should probably start prepping for that. Over on the wine bar, because what would be a more appropriate location, is our nativity set. It is growing – currently in its infancy if you will – and my aunt has been giving us a new piece every Christmas. For now we have Mary and Joseph, with the manger, and the Three Wise Men. Baby Jesus is in the wine bar drawer for the moment, because you know you can’t put Baby Jesus in the manger before Christmas. I also know you are supposed to have the Three Wise Men traveling through the house so they can arrive on Epiphany, but that just isn’t in the cards this year, sorry. In our growing set, we don’t have an “Angel Gabriel” yet, so here is our solution. Above the nativity scene on the wine bar are two pieces special to A and me. One is A’s Duke Bear. This item is a matter of much debate in our house because 1) why is there a Duke Bear? Duke’s mascot is not a bear. Bears really have nothing to do with Christmas. So, what is Christmas-y or Duke-y about a bear?? 2) Where is the bear going? 3) No really, what does a Duke Bear have to do with Christmas? Every year the same debate. I managed to relocate the bear off the mantel, but he is still prominently displayed in our home. Next to inexplicable Duke Bear, is the singing kitty. This kitty was my Grandmother’s – she was in a nursing home before she died and one Christmas a Boy Scout troop visited the home and brought singing stuffed animals for the residents. The little kitty sings We Wish You a Merry Christmas. But in all “Meows”. And on the last note, she holds the meow and it makes me giggle each time. Truth be told, my Grandmother hated this cat. Probably because all day people and visitors (like me) would come to her room and start the cat singing. Anyway, being the only granddaughter, when my Grandmother passed away I got her jewelry and the singing cat. The cat always has a place of honor in the house – this year next to Duke Bear ironically – but close to the front door so it can welcome us as we come home each night. I don’t remember where I picked this up – probably at the Christmas Tree Shop (which if you aren’t from New England you won’t understand and won’t know why shopping for a bargain at CTS is an amazing experience) – but I really like it. I’ve put it up in the dining room for the season. I like that it looks like something you would find in a kindergarten classroom of a Catholic school. It is just both cheerful and solemn at the same time. It is homey and makes me smile. Our big excitement for the weekend (beyond the Pats win, which warmed the chilly day for sure) was getting and decorating our tree. Pictures to come, along with a little “tour” of our Christmas tree ornaments. Filed Under: emerald city, merry married life, who let us buy a house? The holidays have caught up to me, despite the fact that they really just arrived. Our November has been jammed pack with travel, work, visitors, SNOW and yes, turkey. Yesterday was our first real holiday in our home and I think it went rather well. 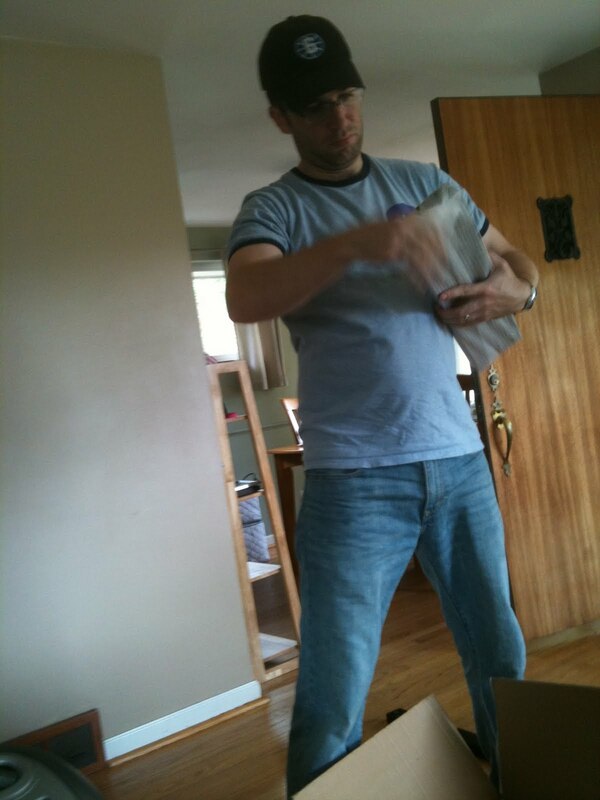 When we bought the house our number one concern was the size of the kitchen, which was smaller than we had hoped. However, we cooked 15lbs of turkey, mashed potatoes, rolls, squash casserole, stuffing, gravy, Toll House Pie and pumpkin custard without a problem yesterday. I was proud of our little kitchen, as well as the cooking/planning/calculating skills of A and me. As mentioned above we have had unseasonably cold and snowy weather here in the Emerald City. It began snowing Sunday night and by Monday night we had two inches and impassable roads. It took us approximately 2 hours to drive 5 miles from work to home. I had two snow days (Tues and Wed), so we worked from home. As I am about to turn the corner from second to third trimester, the extra days of wearing sweatpants and move at a slower pace is much appreciated. Unfortunately for our guests, A’s parents in from the Other Washington, the snow has reduced the ability to site see and explore Seattle, but they did enjoy Northgate Mall, not to mention our day of culinary indulgence yesterday. Tomorrow A and his mom will head to Portland to watch the Evil Empire take on the Ducks. I will brave the Black Friday Weekend crowds at Babies R Us. Keep me in your thoughts. Glider or bust, I say. That or I will hang out in a Starbucks until the game is over. We will see how the spirit hits me. Whatever plans you may have this weekend – eating leftovers, shopping at your favorite mail order online store or traveling, I hope you enjoy some rest and quiet time before it all begins again on Monday. Filed Under: emerald city, merry married life, visitors to the guest room, who let us buy a house? It was the first time we had our neighbors over for dinner so I made my “go to” dinner menu – chile relleno casserole, Mexican rice (Rice a Roni or Liptons, whatever is on sale that week) and cornbread. I made a “sweet and spicy” squash recipe as well, to ensure we had some veggies and to use some yummy seasonal items. (The recipe calls for Kabocha squash, but ours went bad before I used it, so I substituted acorn squash, which was just as delightful). I also made Toll House pie for dessert because it was the lowest maintenance dessert I could think of, while still being so yummy. I found the casserole recipe about a year ago when friends of ours had a baby and we brought dinner over (which is my way of bribing new parents to let me hold a baby). I wanted something that would be low fat, as well as something that would be relatively easy to make and would travel well. The recipe has since become the one I turn to when I am having people over or need to make something easy but nutritious for dinner. I’ve even made it as a “drop off casserole” for a colleague whose wife had surgery and we wanted to send something for the family while she recuperated. The problem I encounter now is that I’ve used my “go to” recipe for dinner with my neighbors – with whom I hope we continue to socialize and have dinner. So I am reaching out to you, dear readers, what are your go to recipes for times like this? One of the things I like most about this recipe – besides it tastes good and seems to impress those who eat it – is that it is easy. Last night from start to serving dinner, it took A and I about an hour to do it all. Chopping, cooking, serving and walking the dog – for all of the menu items (I even had the pie ready to go and it baked while we ate dinner). I like this insurance for when I wait until 2 hours before my guests are coming over to decide to shower and then return to the kitchen to discover there is now about 70 minutes until they are due to arrive. So – when looking for a delicious, somewhat healthy, easy to make, sure to please dinner, what do you end up with? Is there one meal you make for situations like these? Are you smarter than me and have more than one such meal in your rotation? We continued our work on the house this weekend – working under deadline because we have our housewarming BBQ scheduled for Saturday. So we need to get this house in show to the public shape by then. Oh and then cook and feed everyone. I would like to hire a house manager. If they promise to organize the office, they may sleep there. We’ve been doing lots of little projects throughout the week, some more cosmetic then others. As you may have seen on our Twitter feed, we have a compost pail now. Some commented that this seemed awful “yuppie” of us, but composting is required in Seattle, as is recycling. In fact you have to pay for non-compost, non-recycling trash – so it really is in our best interest to try to get our trash output down as much as possible. Besides, the compost pail matches our stainless steel kitchen appliances. We bought and installed some bookcases to match our wine bar. They look pretty snazzy. I expect you to be impressed by them as soon as I take some photos of them. The new bookcases lead to us having to create a hierarchy of books to determine which would be allowed out in the living room, which would be on our “guest book cases” and what books still need to find a home. If you are wondering, Twilight made it to the living room. 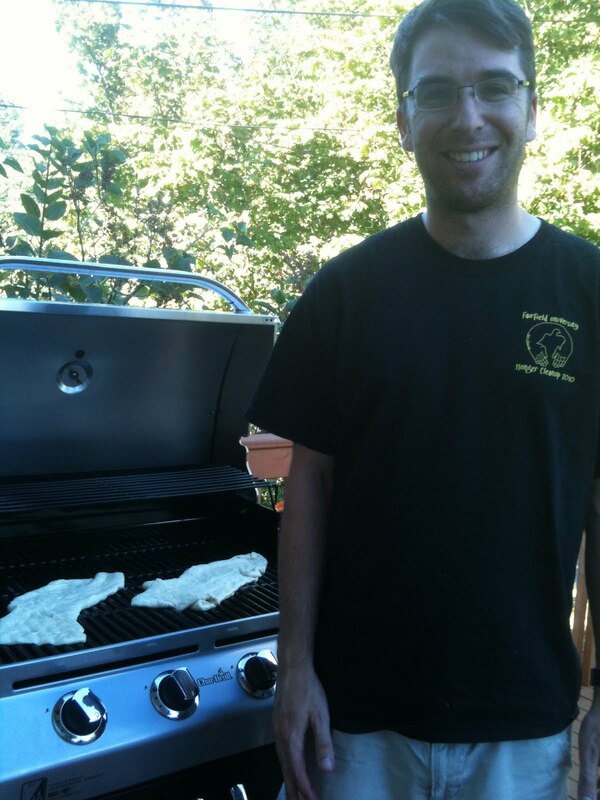 This weekend was our biggest project, a grill. We do not have a large car so despite Lowe’s generous offer to assemble the grill for us, we had to take it in the box and then assemble it ourselves. We chose to do this on the hottest weekend not only of the year in Seattle, but a record-breaking heat weekend. It was 95 on Saturday and 96 on Sunday. It was hot. And for future reference, if you are putting together a large metal item and some of the pieces of that metal item are black – do not leave those black items in the sun and then grab them for assembly. They will be hot like the molten surface of the sun and you will yell out in pain. 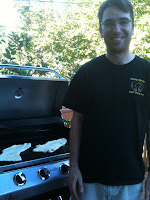 But our “commercial grade” grill is assembled – in less then 3 hours – and even more miraculously we are still married. We made grilled pizzas using Melissa d’Arabian’s recipe and they came out delightful. We have to work on our technique but it best of all it proved that our grill was a success. We even made homemade ice cream for dessert (Alton Brown’s recipe from Good Eats: The Early Years ) and it was delicious.